Good day and Happy New Year from the Floor Bore ! In today’s instalment we are going to begin to talk about the wonderful world of finishes and how to perfectly prepare our floors for the various treatments. In the previous chapters we talked about rough sanding and the various techniques to bring your floors through the gateway to smoothness ! (60 grit ). At this point the floors should look flat and smooth with no trace of the previous grit scratches. What we do now in terms of further sanding depends upon the finish required . We need to remember that all machines and abrasives create scratches on the floors. Our job is to sand the floors to a point where the the scratches appear invisible to the eye once the particular finish is applied. Different finishes require that you take the floors to different levels of smoothness to achieve this . For example if we are applying a water based sealant the floors will generally only need to be taken to 80 grit with our buffing machine and edger sander . This is because this type of finish sits on top of the wood easily masking scratches made with our 80 grit buffer . Conversely oil tints are worked into the wood and actively show up any imperfections in the floors! so we need to finish on a finer grit of 120 or more. 1.The type of finishing machine. We are basically talking about some sort of rotating buffing machine. More recently we have the Bona Flexisand and many other different makes of buffing machines. 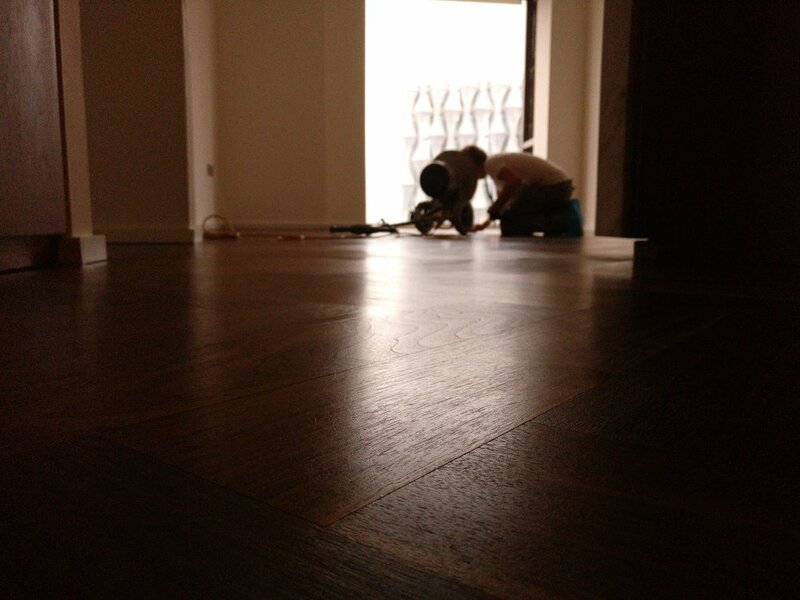 As mentioned the finish that will be used greatly effects how finely the floors need to be sanded. Below is a general table ranging from the coarsest grits to the finest. Abrasives come in many forms and are made of different minerals from very tough (Zirconia, Ceramic) to gentler less scratchy (Silicon Carbide, Diamond ) for fine finishing. The brand and mineral will greatly effect how fine you need to sand the floor. In the next chapter we will look at particular finishes and how best to achieve the perfect look !